– visibility. 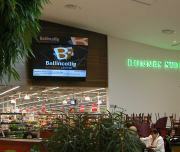 The screen itself attracts people attention and gives you the chance to enhance the visibility of your message. – targeted communication. It’s not about reaching everybody- but those who matter to you and to whom your offer matters- and who else would that be than the people already in your store? – brand building. The screen could be all about you, your offer, your brand with no competitive advertising. Our digital signage software comes unbranded at the screen end, allowing you to insert your brand and graphics. – a source of revenue. Besides displaying your own ads, you can show that of your partners and/or of complementary products and services and charge a fee for this service. In this way, you can cover the cost of your digital signage system and make a profit out of it. The purpose of using digital signage in retail is to communicate more effectively (with more impact – lower costs) and help consumers make more informed choices. By advertising a promotion, a coming deal or a product in stock (or in low stock) retailers offer their clients the chance to make a better decision. – the advertising of your own products, special deals, discounts, loyalty schemes etc. The possibilities are numerous and it’s up to the creativity of the user to make the best of the system. Large retailers such as Westfield London have used it to create memorable customer experiences, using Internet-connected touch screens with cameras incorporated allowing shoppers to photograph themselves and share these photos with their Twitter followers and Facebook friends. A Swedish retailer has recently used digital signage to involve customers in making prices fall. The rise of cloud- based digital signage applications such as digitalsignage.NET has made the manipulation of the system as simple as browsing the Internet: you upload your files, schedule them and then hit publish to show them on your screens. All so retailers can start communicating with their audience quicker and easier. 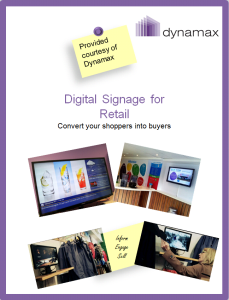 Download our white paper recommended by industry experts to learn more about the use of digital media signage in retail. This entry was posted in Digital Signage, Marketing and Advertising, Software and tagged advertising, digital signage by Dynamax. Bookmark the permalink.